Greetings PCEP Partners! This is Emerson Odango (odangoe@prel.org), and I’m happy to sign on as the new organizer of the PCEP newsletter. I must recognize the amazing assistance of Corrin Barros (barrosc@prel.org) and support of Marylin Low (lowm@prel.org) in helping me with newsletter logistics. We plan on sending out the newsletter bi-monthly, starting mid-September 2015. Be on the lookout for the next issue in mid-November! In the meantime, enjoy these stories from the past few months, and be sure to check out the web portal for continual updates. As always, we look forward to your feedback. Please send comments and questions to Emerson. As part of the Pacific islands Climate Education Partnership, the Hawai‘i Institute of Marine Biology and Centers for Ocean Sciences Education Excellence held the second annual Climate Science Teacher Institute workshop on climate science for high school teachers. The event took place in Majuro from June 15th to 19, 2015, and it builds upon the success of the first workshop, held in Kāneʻohe, Hawai‘i in 2014. The Majuro workshop was developed in collaboration with the Marshall Islands’ Ministry of Education and was hosted at the College of the Marshall Islands. Twenty-four high school science teachers from nine different high schools participated all five days. The topics from the workshop included: weather vs. climate; greenhouse gases; measuring the carbon cycle; El Niño/La Niña; sea-level rise; impacts of climate change on the Republic of the Marshall Islands’ marine resources; local efforts by community organizations; and skills for critical analysis of media coverage. Teachers engaged in hands-on and interactive activities related to each topic that was presented, and they received both physical and digital copies of all instructional materials used in the workshop, including student handouts. Our evaluation surveys indicated that teachers were excited to have activities they could reproduce in the classroom with material available on island. Teachers also worked together to adapt lessons to their own classrooms, and they presented these lessons to their colleagues. Other highlights of the week included weather observations, a snorkel trip to a local coral reef, and an intertidal reef walk to learn techniques for monitoring local coastal environments. 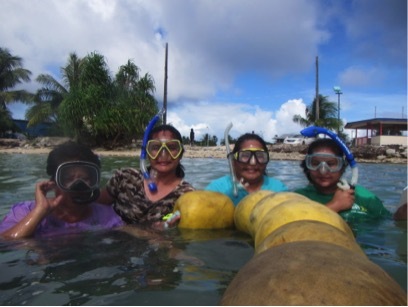 In July 2015, the High Island Environment and Low Island Environment posters and selected activities were piloted on Weno, Chuuk, FSM at two summer program locations: Mwan Elementary School and Chuuk Women’s Council. The Chuukese and English versions of both the high and low island posters were presented to groups of mixed-grade students from elementary grade levels. PREL staff facilitated this pilot by having students read through the poster text, identify local Chuukese names of the flora and fauna illustrated in the posters, and match the environments to what they see in their home island. For each location, the posters and activities were piloted over the course of two days. On the first day, the students explored the High Island Environment poster, first in Chuukese, then in English. This was relevant for these students on Weno, since they reside on a high island. On the second day, the students explored the Low Island Environment poster, also in Chuukese and then in English. Several activities were piloted so as to contribute to the refinement of a list of potential activities that can be distributed alongside the posters. One piloted activity involves having the students walk to a nearby environment that is illustrated on the poster. For the Mwan Elementary School group, this was the mangrove swamp (chia), and for the Chuuk Women’s Council group, this was the seashore (neppi). The students were directed to pay close attention to what they observed through their senses (e.g., sight, smell, hearing, and touch). They then returned to the classroom to draw and write about those observations, which they then presented to classmates. 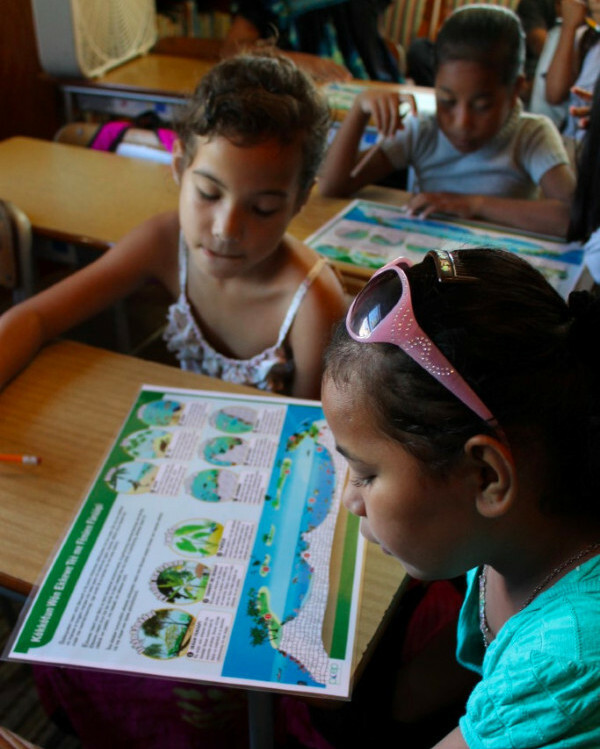 Other activities included having students write local names of the flora and fauna they can identify directly on the laminated posters using dry-erase markers, as well as drawing on the white space on the back of the poster human activities that occur in the environments discussed (e.g., fishing, planting taro, and harvesting bananas). At the end of the second day, the facilitators collected questions from the students based on what they were curious about or interested in as related to the poster contents. The experiences from this successful poster pilot on Weno will help refine the learning activity handout, which will soon be made available on the PCEP resources webpage at http://pcep.prel.org/resources/. Note that the High and Low Island Environment posters in many—but not yet all—of the languages represented by the regions in which PCEP works are also available on the resources webpage. Please continue to check that webpage for more updates! PCEP staff offered a two-hour session for teachers at the Pacific Educational Conference in Majuro, RMI. During the session, about 40 teachers were able to engage in PCEP’s newest resources as PCEP staff demonstrated ways to utilize PCEP’s posters, books, and computer interactives for learning and teaching. All PCEP resources are available to download for free at http://pcep.prel.org. 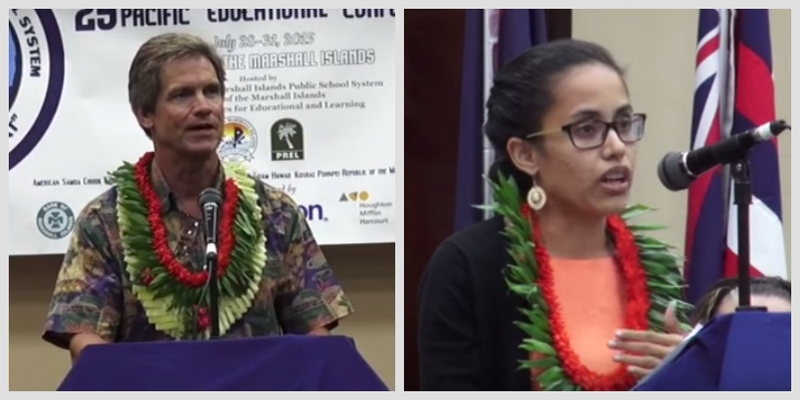 On July 28, Dr. Chip Fletcher (UH Mānoa; PCEP Co-PI) and Ms. Kathy Jetnil-Kijiner (College of the Marshall Islands) shared the stage to welcome over 1,000 educators to the Pacific Educational Conference in Majuro, RMI. In his address, Dr. Fletcher provided strong scientific evidence of the impact of climate change to the Pacific and offered six key messages about adapting to climate change consequences. Ms. Jetnil-Kijiner, who spoke at the 2014 Opening Ceremony of the UN Secretary-General’s Climate Summit, responded to Dr. Fletcherʻs message with stories of stewardship in the Marshalls and through her performance of Dear Matafele Peinem. See the keynote address and PEC workshop materials at http://prel.org/pec/ (speeches start at 9:47). Dear Matafele Peinem can also be seen on YouTube: https://youtu.be/mc_IgE7TBSY. 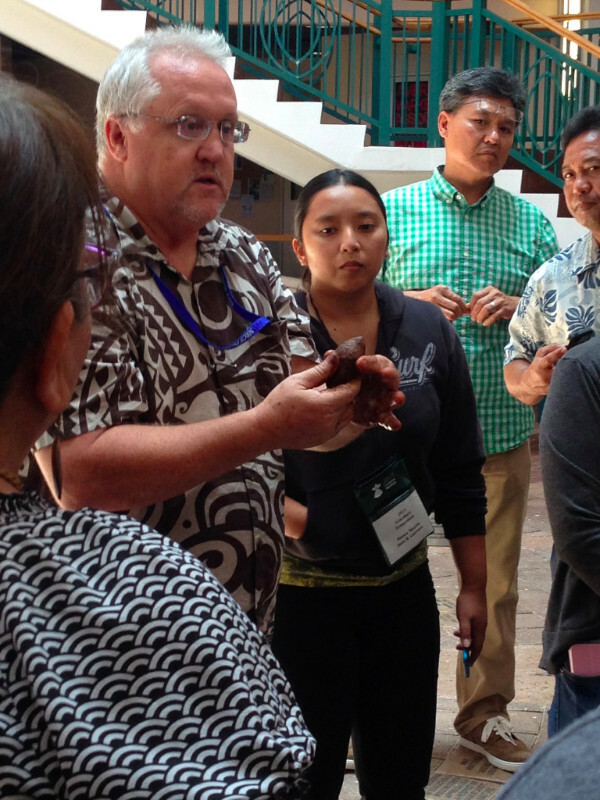 The 2015 Guam Educators “Soil and Water Conservation and Climate Change Symposium” was held on August 10–12 at the University of Guam. This annual event brings together teachers, local government, and private agencies to share information and resources related to conservation education on Guam. This year’s focus was on climate education. The primary sponsors of this event included the Northern and Southern Soil and Water Conservation Districts, Guam DOE, NOAA, USDA-NRCS, University of Guam, and PREL. Some of the many presentations at the Symposium include the following: Care of Our Common Home by Archbishop Anthony S. Apuron; Local Adaptations to Global Change Variability, by Dr. Jason Biggs; Climate Change Impacts to Pollinators by Allison Hadley; Ocean Acidification by Adrianne Loerzel; and Defending Native Species by Roland Quitugua. Sessions were also provided that focused on the connections of culture to conservation and resiliency. Some of those sessions included Heritage Preservation and Environmental Conservation by the Humatak Community Foundation, as well as Preserving Amot and Traditional Healing by Haya Foundation. Participants also attended the Guam Northern Aquifer Tour. Special educator sessions were led by Ms. Sabina Perez to assist teachers plan strategies to integrate content, information, and activities modeled at the symposium into local classrooms. For example, one session at the symposium focused on Soil Health and Climate Change conducted by John Hobart Lawrence from the USDA-NRCS. Mr. Lawrence facilitated discussions around the quality of soils and had the teachers prepare seed pods. The Guam DOE Chamoru Studies Coordinator—Mr. Rland Quitugua—demonstrated how to make and use Chamoru slingshots. During the Aquifer field trip, teachers used the local slingshots to disperse their seed pods within remote areas that needed plant regrowth. Over 90 teachers attended the Summer Science Workshop held in Yap in August 2015. 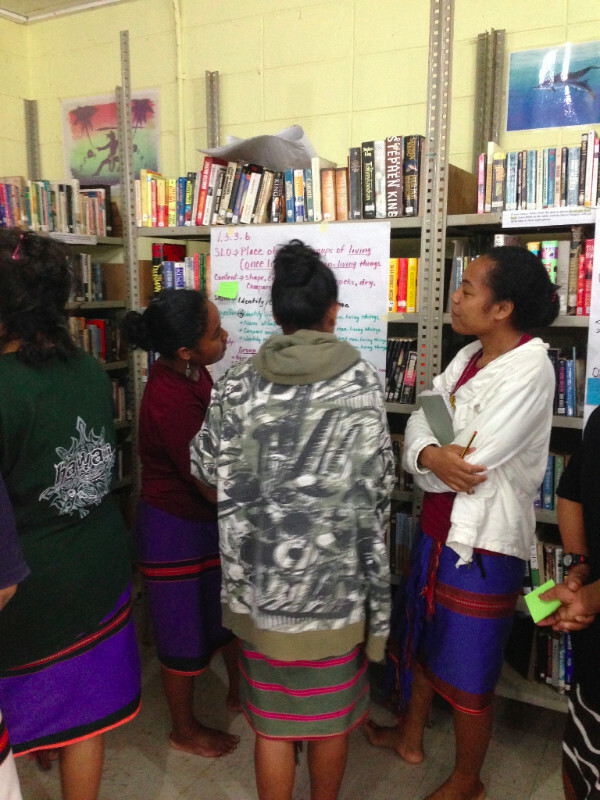 This workshop was conducted by the Yap State Science Curriculum Team with support from PREL. The Science Team had revised the State standards and benchmarks, which included new benchmarks and student learning outcomes related to climate education. Neighboring Island teachers were brought in for the summer trainings, and additional workshop sessions were provided for the Waab zone (main island) teachers. The Science Team provided information related to the new benchmarks and student learning outcomes, and they led participants through a process to break down the student learning outcomes for lesson development. PCEP Resources were shared and discussed, and teachers used the new climate education resources to design instructional lesson plans around the new benchmarks and learner outcomes. Each school was provided an electronic copy of the PCEP Resources that have been compiled as of date.